When World War 1 began in 1914, the Navy started renting private boats that might be able to spot and out run enemy submarines. 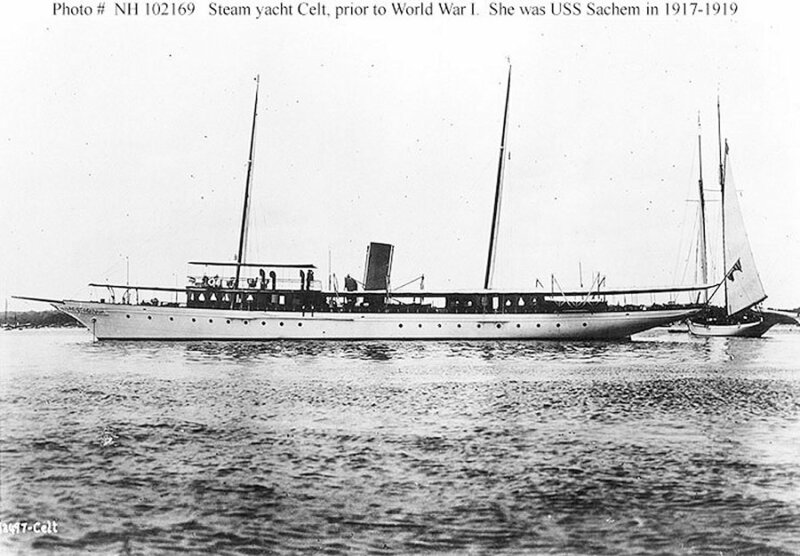 In July, 1917, the Navy got ahold of the Celt, renaming it the USS Sachem, and used it as a Coastal Patrol Yacht. They loaded it up depth charges and machine guns, and put her to work to defend us against enemy submarines. They also decided to use her for research and experiments into new ways to defend against submarines, and they enlisted none other than Thomas Edison to conduct those experiments. Edison did his work aboard the USS Sachem, mostly around the New York Harbor, until the war ended in 1918, when his funding also ended. The Sachem was returned to her current actual owner, Manton B. Metcalf, in February of 1919. It was later sold to a banker named Roland L. Taylor, and then to Jacob Martin of Brooklyn, New York in 1932, who converted it to a fishing boat. It was reacquired by the Navy in February of 1942 for $65,000 and converted for naval service. It was commissioned as USS Phenakite in July of 1942. Her job this time was to patrol the waters off the Florida Keys during World War II. She was decommissioned to undergo modifications and placed back in service in November of 1944. She was used for testing sonar systems until she was put out of service in October of 1945, and transferred to the Maritime Commission for disposal in November of 1945. The vessel was then returned to her previous owner, and renamed the Sachem in December of 1945. 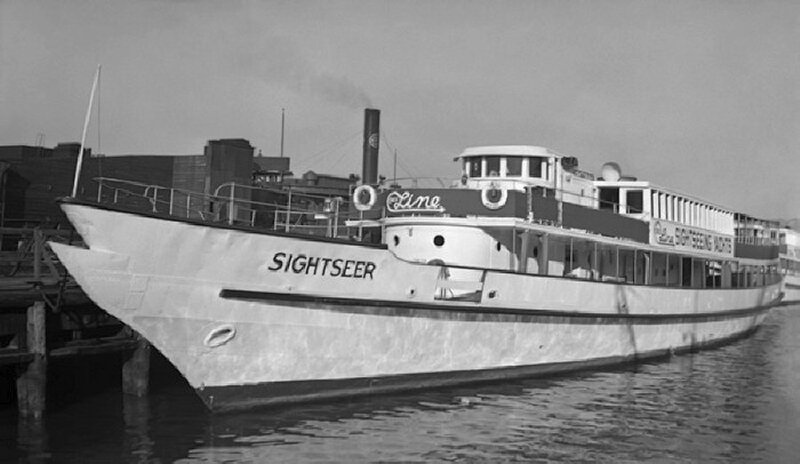 It was later resold, this time to become the flagship of the new Circle Line Sightseeing Cruises in New York City, where she was again renamed, this time to the Sighseer. 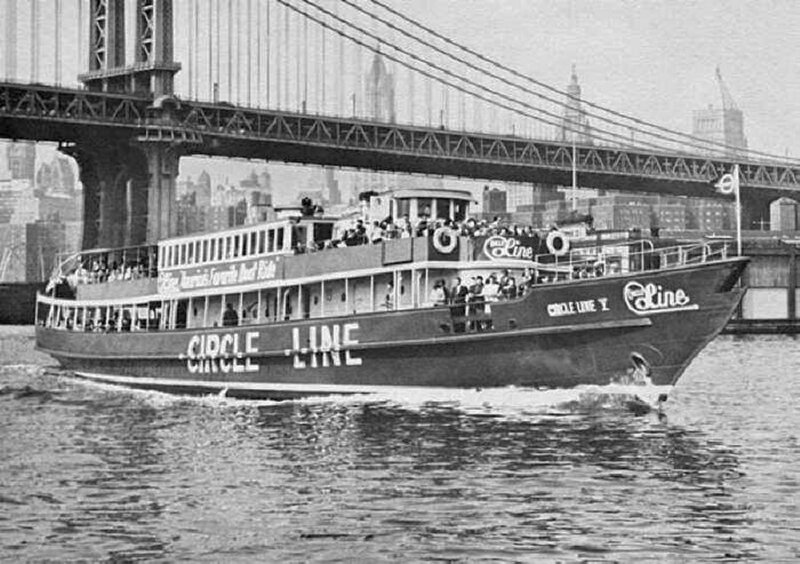 In 1986, Cincinnati resident Robert Miller bought the Circle Line V for $7,500. Miller said it took him ten days to repair the boat and get her seaworthy again. 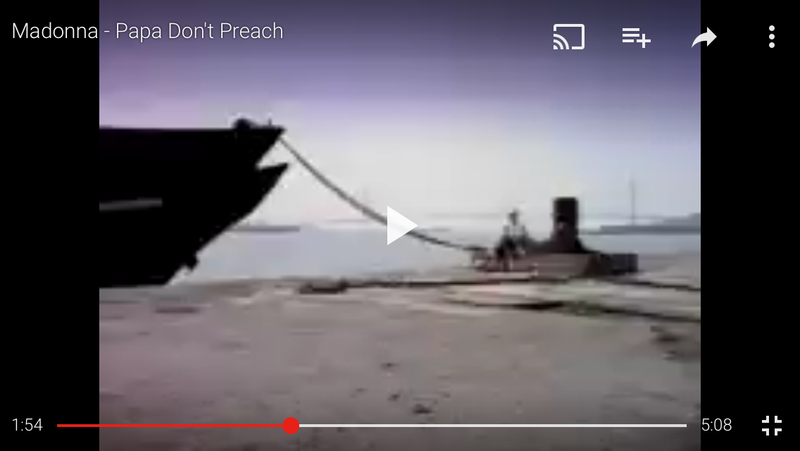 One day while working on the ship, a representative of Madonna showed up, and asked him if they could use it in one of her videos. You can see her Briefly in Madonna’s video for Papa Don’t Preach. Seriously, blink and you’ll miss it, took me 4 tries to get this damn screen shot. Eventually, Miller decided to bring the boat back to some land he owned in Petersburg, Kentucky. He sailed from New York City, through the Great Lakes, down the Mississippi River and onto the Ohio River. 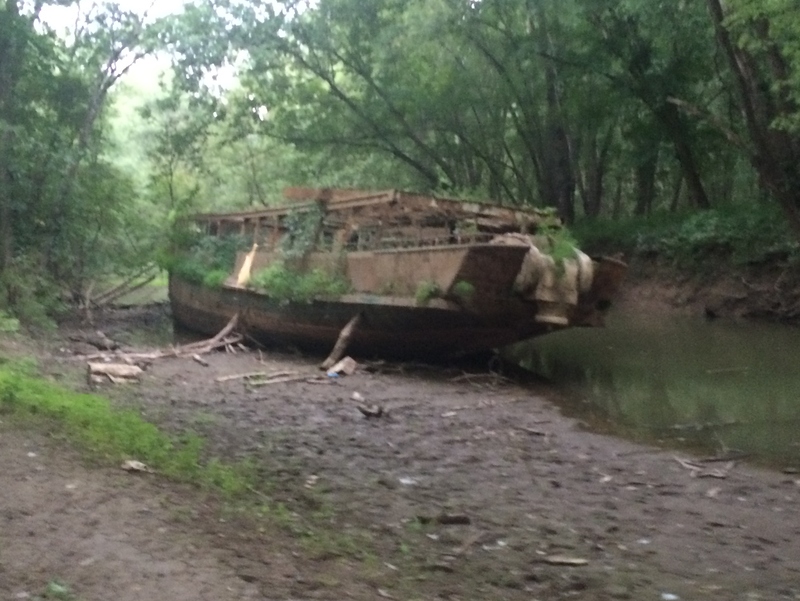 About 20 miles west of Cincinnati, he turned the boat down a creek into a small tributary of the Ohio on his property, and there I guess is where the story ends…she has sat there ever since. It’s Pretty easy to get to, it shows up in a search on google maps. As you can see from the pictures below, she’s rusted, stripped down, covered in dirt, and even has a few tress growing off of her. There’s an old rope ladder hanging off the side so you can climb up, but its still not exactly what I’d call safe. Both times we were there, it was or had been raining, which made it worse, as it turned the dirt covered deck into mud. There’s also some opening’s in the deck to watch out for. If you decide to go looking for her, be courteous to the locals, and leave her how you found her. A lot of this info came from the Queen City Discovery blog, they have a lot more detail there. If you want to check it out, click HERE. Be very careful going down there. Not worth a trip to jail in my opinion but it was a cool piece of American history. The ship itself is very dangerous with holes everywhere. Enter the property at your own risk. I found this facinating. As a wanabee archeologist/historian I would go in a heartbeat. I live too far away and have no funds. Thanks for the glimpse and for preserving the memory of this piece of American history! 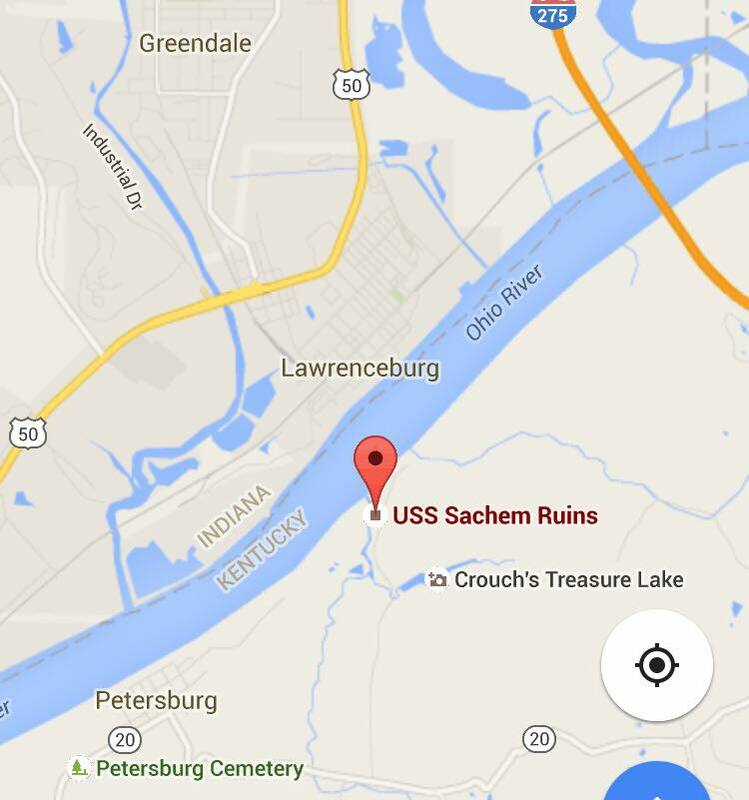 Please remember if you decide to go see the Ghost Ship (USS Sachem) : it is a private property and privately owned. Yes it is very dangerous. Do not go aboard, it’s against law, it’s trespassing. It is fine if you only paddle around it or see it from water but the land is not a park. Respect the owner’s tranquility by only viewing the ship by water and quietly. So no risk of being injured or shoot. For more informations on this ship, its history, pictures, current condition, please visit my website http://www.the-sachem-project.org We are a group focused on the preservation and potential restoration of the USS Sachem. Wow it’s amazing to see what is right outside your door.